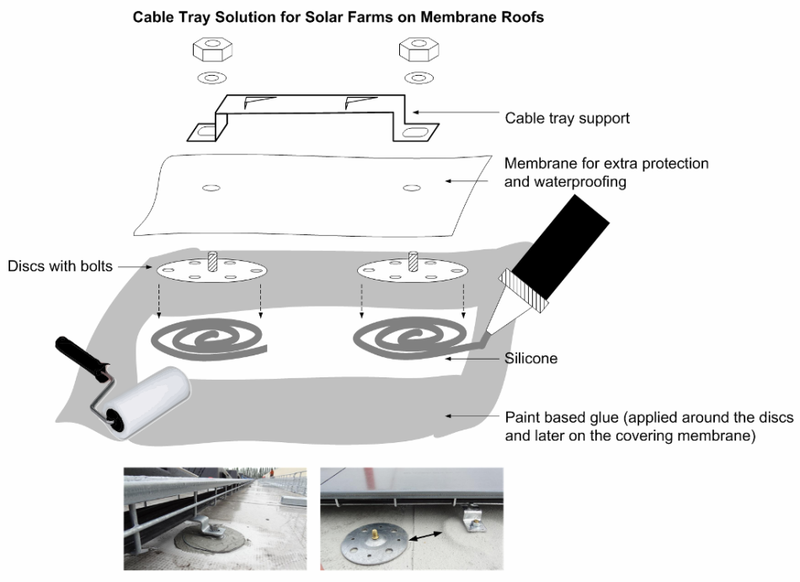 If your warehouse, supermarket or factory has a membrane roof and you want to install a solar farm on it, you need a specific solution both for the modules as well as for the cable trays. So here's an interesting solution to mount cable rails on membrane roofs. As usual, parts are supplied by OBO Bettermann. Clean the membrane surface where the discs will be placed. Add silicone. Press the discs onto the silicone and make sure the silicone sticks out through the holes in the disc. Even out the silicone above the disc (with a spatula or with your fingers). Glue the membrane pieces onto the discs (extra protection and waterproofing). Leave it one to three days to harden and then mount the brackets and the cable trays. Tip: Watch out not to step on nuts, brackets or any other sharp objects while working on membrane roofs. You don't wanna puncture the membrane. Stay green and cycle to work! Subscribe to get useful information about solar panels right in your inbox. Subscribe to receive articles right in your inbox.